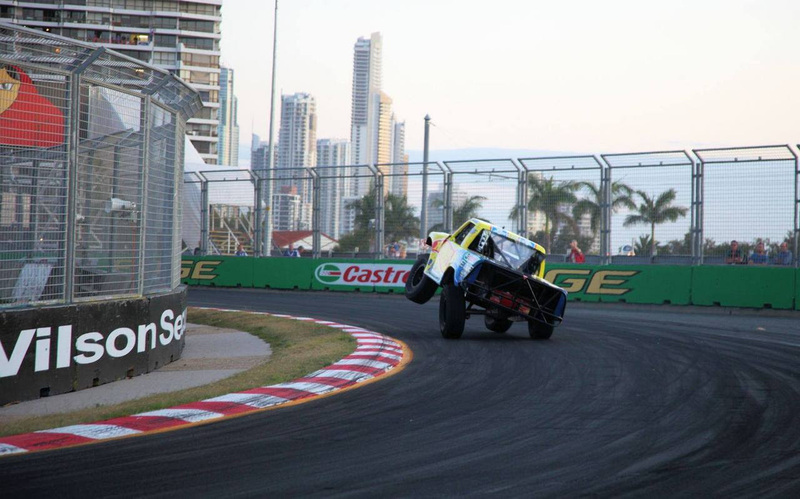 Gold Coast, Queensland (October 23, 2015) – Burt Jenner capitalized on a mid air collision by the leaders on Lap 5 to cruise to his third SPEED Energy Stadium SUPER Trucks Presented by TRAXXAS victory of 2015 in race one of the Gold Coast 600. Indy Lights competitor Matthew Brabham from Gold Coast, Queenland, Aus. in just his second SST start would finish second, while SST newcomer Paul Morris of Norwell, Queensland, Aus. completed the podium. TRAXXAS racer and current SST Points leader Sheldon Creed, of Alpine, California was aggressive from the start of the 10-lap final and moved past truck after truck from his last-place starting position in the first three laps. Creed and Peoria, Ariz. driver Scotty Steele would capitalize on a mistake by early leader and first SST competitor Brett Thomas of Gold Coast, Queensland on lap three to move past. As Creed and Steele would battle it out for the lead side by side on Lap 4. Burt Jenner of Los Angeles, Calif. was sitting in the position he wanted to be. “In these SST races, there is so much chaos that develops early. I’ve learned you need to run your own race sticking to your own game plan and watch the heads pop around you and wait for your opportunity to capitalize,” stated Jenner. Jenner did just that sitting in the fourth position. On Lap 5 Creed and Steele would collide with each other mid-air at the start finish line disrupting both trucks momentum, and badly damaging Creed’s truck. As Creed’s machine dropped off the pace with a broken axel Jenner was able to overtake both trucks for the lead. With most drivers struggling to hit their marks on the fast and technical temporary beach side street circuit that makes up the 15-turn 1.85-mile (2.98 km) course built for the V8 SuperCars, Jenner raced the second half of the race flawlessly and pulled away from the hornet’s nest of trucks battling for position behind him. The next lap would see Steele run wide and collect himself into the wall allowing Def Leppard/LIVE teammate Brabahm to move past and secure the second position. Quick Qualifier Paul Morris of Norwell, Queensland used his local knowledge of the Surfers Paradise street circuit and raced with a conservative style from his ninth starting position to overcome an early spin and tangle with Greg Gartner of Penola, South Australia to finish on the box behind Jenner and Brabham. Robby Gordon of Orange, Calif. would race his SPEED Energy/Toyo Tires truck to a fourth place finish, followed by local competitor and stunt man Matt Mingay of Gold Coast, Queensland who claimed the fifth position. Crandon, Wisc. driver Keegan Kincaid would finish in sixth position in his TRAXXAS truck, just ahead of Toyo Tires driver Greg Gartner. 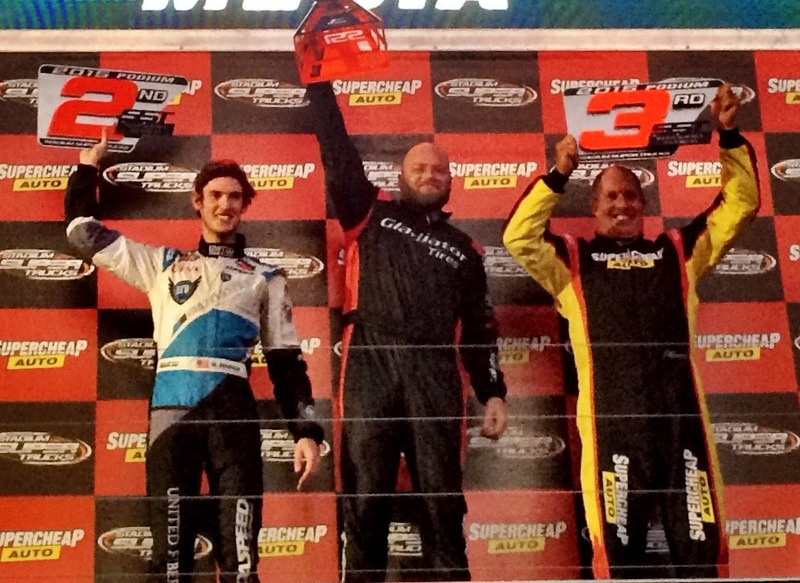 Early race leader Thomas driving the TFH Hire truck would complete his first SST race in the eighth position ahead of Creed who limped his truck to the finish. While Bill Hynes of Nazareth, Penn. took the tenth spot in his Def Leppard/LIVE/Think Loud Recordings truck ahead of teammate Steele who experienced suspension damage on lap six and dropped out of competition. The SST trucks will race a second round Saturday afternoon in front of anticipated massive crowd at 12:40 p.m. local time. SST features identically prepared trucks, which are made to resemble their scaled-down TRAXXAS radio-control-car counterparts. Like their TRAXXAS namesake the trucks are designed to take flight. However, unlike RC trucks, they produce 600 horsepower generating speeds upwards of 130 miles per hour.